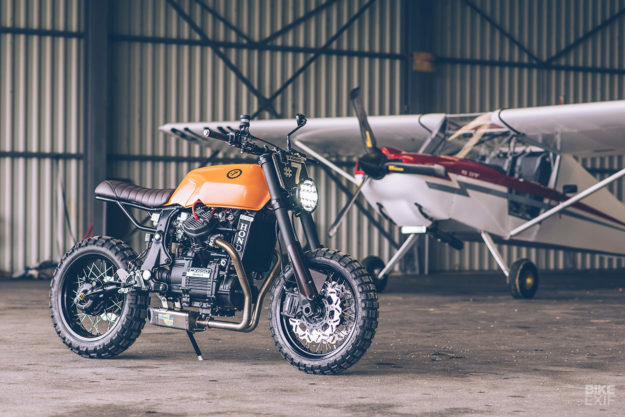 We all know the Honda CX500. 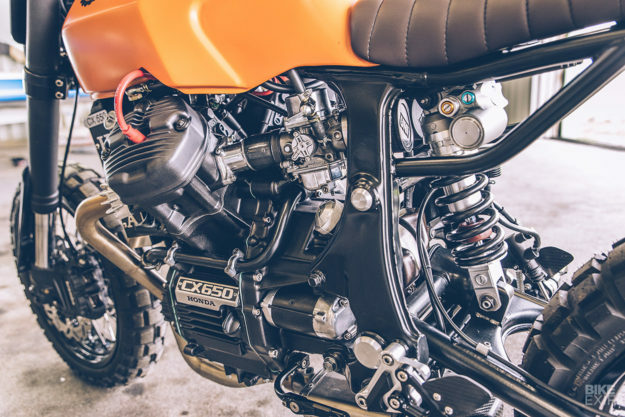 It’s been the gateway drug for many into the custom scene: a cheap and reliable V-twin, with a gawky frame just begging for a session with the Sawzall. We don’t often see the CX650 though. Introduced in 1983, the CX500’s big brother offered more power, similar economy, and easy cruising—as long as bumpy roads didn’t unsettle the Pro-Link rear suspension. 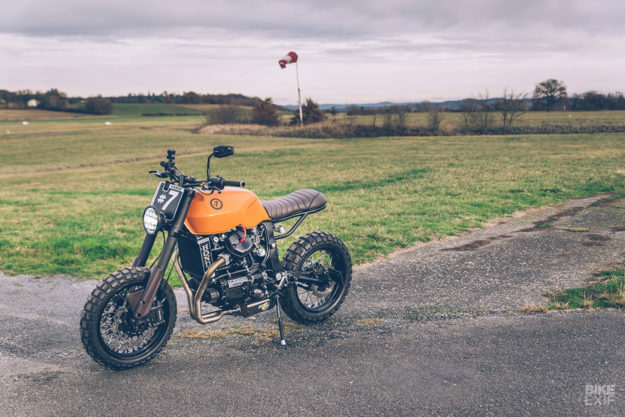 This terrific CX650 comes from the French workshop Freeride Motos, which is effectively the nom de plume for multi-talented builder Pierre Dehrs. Pierre’s been working by himself for five years now, restoring older bikes and preparing enduro and motocross machinery for the vintage racing classes in France. 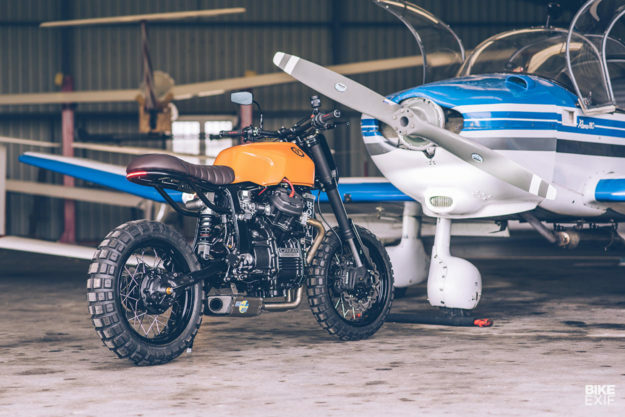 He’s one of those rare and talented individuals who can handle the tricky aspects of bike building without having to farm the work out—from welding to machining to paint. 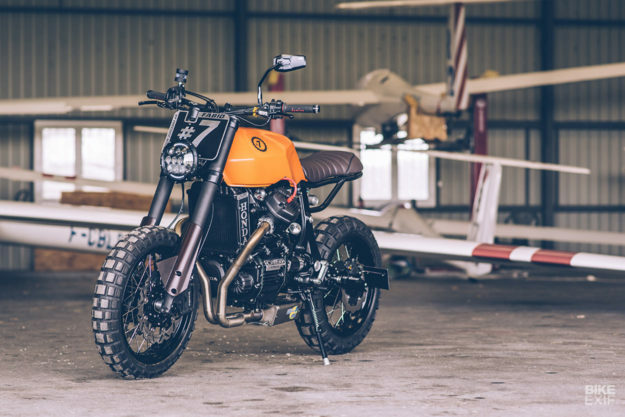 But occasionally, Pierre puts aside the bread-and-butter work for a custom project, like this Honda CX650 scrambler. 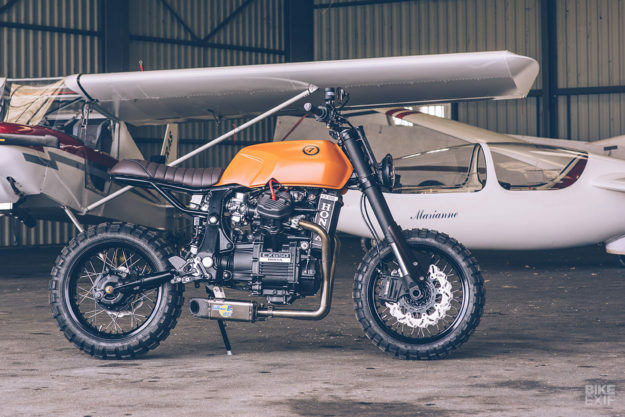 The CX650 is not the obvious base for a custom, with a stamped sheet-metal frame, heavy wheels, and a rear suspension system that Pierre estimates to weigh more than 25 kilos (55 pounds). 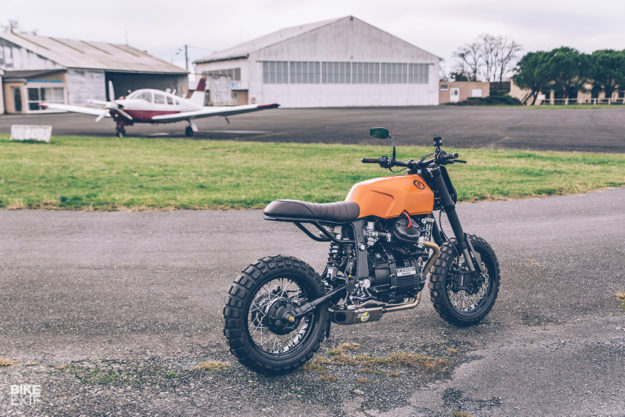 Pierre managed to convince his client Fabio that the CX650 could be transformed into a simple, stripped-down scrambler. And stripped down it was: Pierre discarded almost everything except the engine and frame. 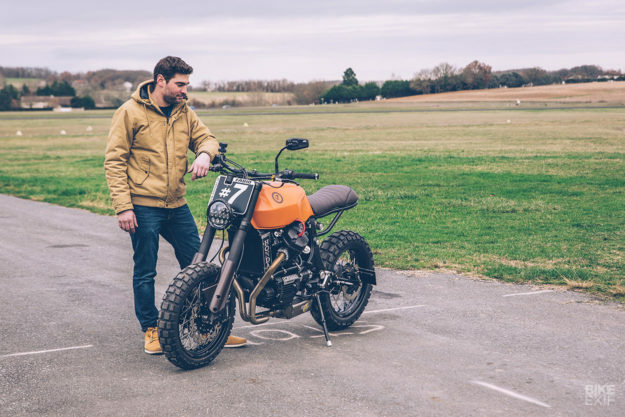 After finishing his calculations, Pierre started by installing the forks and brake system from a KTM 950 SM—lowered and treated with a matte black ceramic coating. 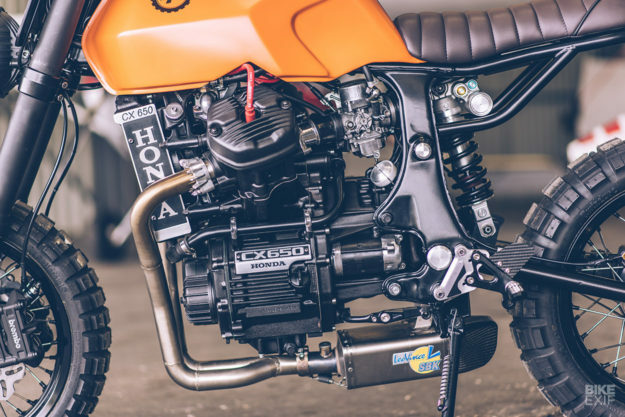 The front hub is from a KTM 990 Adventure, which took a few hours to adapt, and the Brembo calipers are now hooked up to a RCS radial master cylinder. That was the easy part. Pierre then replaced the entire rear suspension with a CX500 setup, to lighten and shorten the bike. The monoshock is a Showa unit from a Yamaha YZF-R6, modified with a tailor-made spring, and the brake system is now Brembo to match the front. This CX650 rides on very tasty 17-inch black anodized rims, 3.5 inches wide at the front and 4.25 at the back. The rubber is Continental’s ubiquitous and well-regarded TKC80. We were surprised to find out that the tank is not a transplant, but the original. 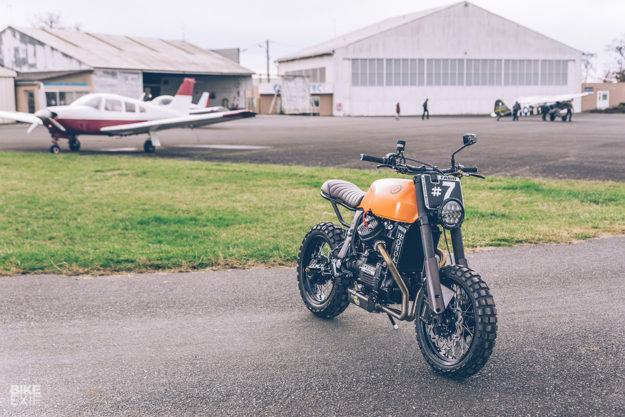 But the chunky look suits the scrambler well, and even the cutouts on the sides (for the front of the original seat) look the part. There’s still a fair bit of modification going on with that tank. There’s a LighTech aluminum fuel cap assembly, the sides are cut slightly to reveal the carburetors and cylinder head, and Pierre has raised it a little at the rear too. 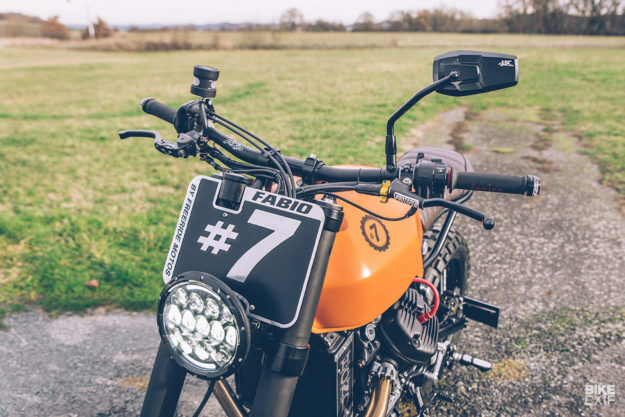 Capacity is slightly reduced, because the tank now hides electrical parts such as the battery, a Motogadget m.unit, an m.lock RFID digital ignition lock, and relays. The new aluminum seat base houses the regulator, the only electrical component not placed under the tank (for cooling purposes). The seat is plush enough to cushion any bumps that might sneak past the high-spec suspension; it’s covered with an imitation leather from Skai, a household name with car interior designers. After all this, the engine work was relatively straightforward—especially for a mechanic of Pierre’s ability. He stripped and rebuilt the liquid-cooled transverse V-twin and its carburetors, and laid on satin black paint with a grained effect. There are subtle differences in color, with parts such as the rocker and clutch covers painted matte to match the coating of the forks. Pierre also made the no-nonsense exhaust system in-house from stainless steel, and hooked it up to a stubby Leo Vince muffler. 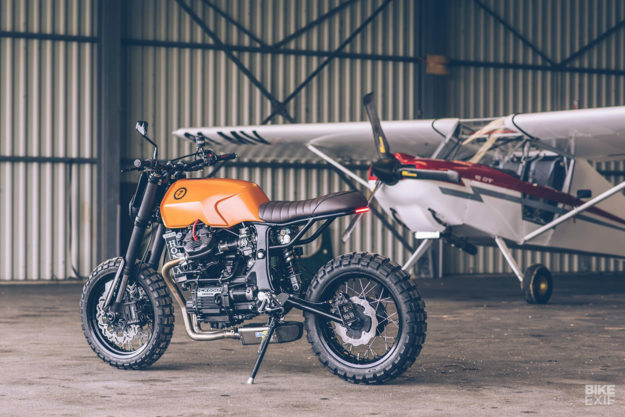 The high-end cockpit area will be a shock to anyone used to a stock CX650. 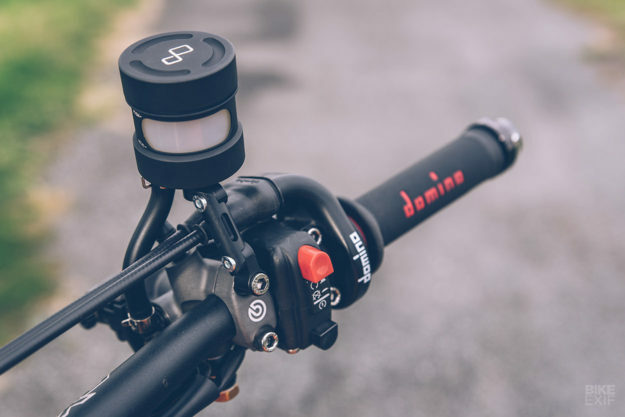 There’s a quick action throttle and switchgear from Domino, turn signals from Motogadget, a Daytona Velona speedo and cabling and hoses from Venhill and Goodridge. It’s the stunning orange tank that grabs the eye at first though, with a matte orange base overlaid with coats of low-ley orange glitter. But the devil is in the details, and that’s Freeride’s specialty: Pierre has even replaced all the fasteners, using high-grade stainless steel ones, and mostly polished. Everything is very carefully chosen, right down to the ‘#7’ on the front number plate. That was the race number of Pierre’s client, who was an international supermoto pilot in a previous life. Which means he’ll know exactly how to get the most out of this beautiful machine.